I posted a picture recently to my Facebook page of a Seiko Sportura SQL007 -an alien-looking chronograph that looks like a lump of molten metal with four separate dials covered by four separate crystals and powered by a hybrid quartz/mechanical movement. It charges up with the movement of your wrist, displays the time just like any $50 battery-powered plastic piece. But the chronograph is fully mechanical, capable of measuring time to 1/10th of a second when most mechanical chronos can only manage 1/8th – and when you activate it, one of those four dials, dedicated to fractions, spins like a top. It’s an amazing thing, well worth, I felt, the asking price of about $2,500 almost 10 years ago – but my watch-snob friends were unimpressed. Some called it aesthetically challenged, which I suppose is fair enough (to each their own); but most of the commentary basically amounted to, “why would anyone spend so much on a Japanese watch?” Well, why not? 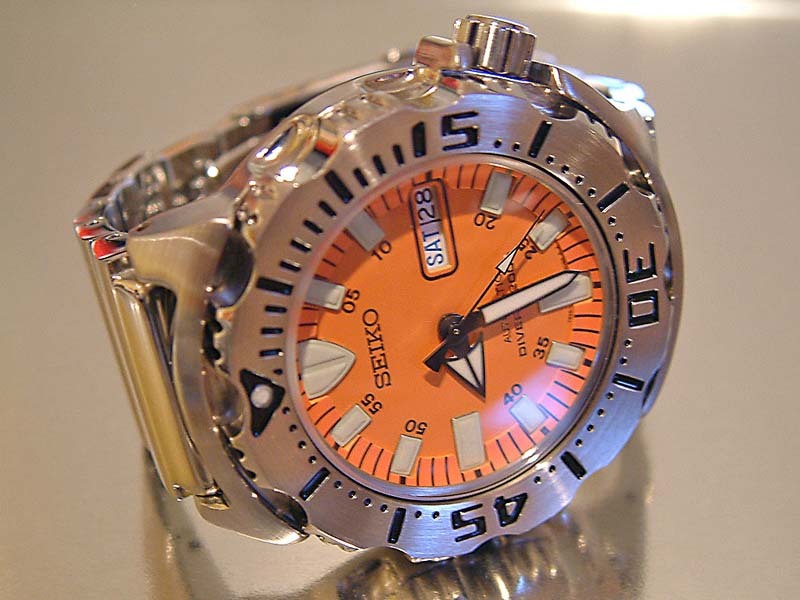 By any traditional measure of the watch-snob’s lexicon, Seiko belongs right up there with the big boys. Us geeks get all wound up about the idea of “manufacture” movements, developed, blueprinted, machined and produced entirely in-house by the fancy-schmancy Swiss watchmakers. IWC’s “regular” pilot’s chrono retails for about $7,000, with a movement based on the robust, but ubiquitous, Valjoux 7750. Upgrading to the “in-house” version, with the hour and minute indicators on one subdial, requires at least an extra $3,000. TAG Heuer, Omega, Breitling, and any other mainstream luxury-watch brand you care to name (the exception being Rolex) do most of their volume with nicely-finished versions of ETA movements also found in things as lowly as Swiss Army or even Swatch. Yet even the cheapest Seiko – and we’re talking sub-$500 here – features totally in-house mechanicals, and those mechanicals are even more in-house than most Swiss brands. Seiko doesn’t only make all the metal bits in the movements; they also make the lubricants, the cases, the bracelets, the dials – stuff that even the big-name brands often buy in from specialist manufacturers scattered around Switzerland. Because of the company’s huge sales, and thus their massive economies of scale, impressive technical innovations (the magic lever winding system, Kinetic electro-mech movements) can be had by the masses, often at incredibly reasonable prices. Speaking of which, while many brands continue to refine and decorate concepts that were introduced literally centuries ago, Seiko’s always been on the cutting edge. If you’re enough of a chrono geek, you have no doubt read about the race between Heuer/Breitling/etc. and Zenith to produce the world’s first self-winding mechanical chronograph in 1969; most of those accounts forget to mention that Seiko was in the race too, having brought its 6139 movement to market the same year (and in a number of uniquely-shaped cases adorned with colourful dials that made them way more fun). Seiko was, of course, one of the brands responsible for developing the quartz movements that almost killed the Swiss industry; more recently, they’ve been combining batteries and mechanics in clever and interesting ways, with their Kinetic and Spring Drive movements. The latter features a second hand which glides seamlessly along, with no ticking sound, no stop-start jerkiness – a true representation of the passage of time. Because of their huge volume and mass-market appeal, Seiko’s also been more adventurous with its designs than the stick-in-the-mud Swiss and Germans. While there are certainly models in their lineup that shamelessly (a little too much so) ape designs familiar from other manufacturers, the company’s also been responsible for its share of iconic watch designs. 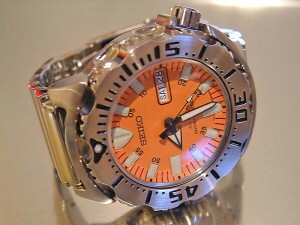 The “tuna can” diver’s watch remains one of the most distinctive tool watches in history; the “monster,” its modern contemporary, has a butch, aggressive design totally unlike the more refined European waterborne pieces. More recently, the Arctura and Sportura chronographs have found unique and interesting ways to combine the time of day and the elapsed chronograph time, and the company continues to build small-volume mechanical models with amazingly different case and dial designs. And what unites them all has been, if not the sharpest edges or the finest brushed finish, a certain tough, unburstable quality that suggest they can take a beating. I wore a Seiko5 automatic through most of high school; it literally never left my wrist for years, living through showers, shocks, scratches and the kind of abuse only a teenager could dish out. By the end of it, the mineral crystal was scratched all to hell, the bracelet was a bit loose and one of the hour markers had fallen off. But it was still keeping good time. Upon learning that I’m into watches, people often ask me how many of them I have. My typical answer is “four – and a half-dozen Seikos.” But the fact that I’ve kept so many Seikos over the years suggests that I have as much affection for them as my Rolexes and Tags and IWCs. Just because Seikos aren’t expensive doesn’t make them any less cool or desirable. Posted in Uncategorized and tagged IWC, kinetic, Rolex, Seiko, Seiko5, Sportura, spring drive, SQL007, TAG, Tuna can, vintage seiko.